Learn to Speak German Confidently! Why do you want to learn German? Please use the form below to tell us why you want to learn German. When you go to a restaurant in Germany, a waiter will NOT bring you a complimentary glass of water. In fact, it’s almost impossible to get a glass of tap water in a German restaurant even if you ask for it. Now the tap water in Germany is generally safe . . .
Before you start studying foreign languages, you tend to think that every language has a way of saying the things that you currently say in your language. However this really isn’t true. What you will find when you learn another language Like German, is that it has ways of saying . . .
German is very important language. Obviously you are interested in learning German or you wouldn’t be looking at this web page, but here are some great reasons for learning German. Of course not all these reasons my apply to you, but remember the best reason for learning a language is . . . When Should I Say Möchte, Würde or Hätte? The English sentence “I’d like some tea” can be translated into German in three different ways: 1. Ich möchte etwas Tee. (I want something tea – I want some tea, please.) 2. Ich würde gern etwas Tee haben. (I would like something tea have – I would like some tea, . . . 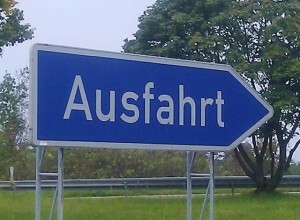 If you’ve ever been on a German Autobahn, you’ve seen this sign: To English speakers it is a funny word that sounds a lot like the English word fart. Now…what exactly does the German word “Ausfahrt” have to do with the English meaning of “fart”? To be exact … nothing. . . .
Do you realize that whenever you say “a,“ “o,“ “u,” and “i,“ you actually make two sounds, not just one? Say “a” out loud; you just said “aa-eeh.” Try the same with “o” (“aw-ooh”) or “u” (“y-ooh”). English vowels are diphthongs. In German, however, vowels do not consist of diphthongs; . . . Most of the consonants in the German alphabet are very much like their English counterparts. A few, though, have striking differences. Others have only very subtle differences, and these are the ones you will want to pay the closest attention to, since the proper pronunciation of these consonants will determine . . .